Real Madrid have sacked coach Fabio Capello - just 11 days after the Italian led the Spanish giants to their first league title since 2003. The 61-year-old still had two years to run on his contract at the Bernabeu, but drew criticism for his tactics. Real president Ramon Calderon told Marca newspaper: "We've laid the foundations, but we need to find a more enthusiastic way of playing." Getafe's German coach Bernd Schuster is tipped to succeed Capello. 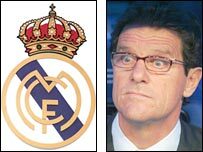 Capello, who joined Real last summer from Juventus on a three-year contract, had also guided Real to the Spanish title during his one previous season in charge in 1996-97. Calderon brought Capello to the Bernabeu last July and charged him with the task of reining in the players and clearing out dead wood on the playing staff. Spanish pundits believe Capello paid a price for his treatment of England's David Beckham. After Beckham confirmed he was joining LA Galaxy at the end of the season, Capello publicly declared he would never consider Beckham for the first team again. Capello was forced to back-track on that, and it was Beckham's form which inspired Real to the title. Capello's dismissal underlined that Real show little sentiment when it comes to firing successful managers. Real's last Spanish title victory in 2003 was not enough to keep Vicente del Bosque in the job, while German Jupp Heynckes was sacked after guiding Real to the Champions League title in 1998. Real's sporting director Predrag Mijatovic said: "We have taken the decision not to continue with Fabio Capello next season. "It was a difficult decision but a unanimous one based on an exhaustive report I made to the board. "We don't think Capello is the right person to lead Real Madrid into the future given what we want this club to achieve. "Now we have time to think over who will be the next head coach." Capello, who previously managed AC Milan and AS Roma in addition to Real and Juventus, maintained his record of winning a league title with every club he has managed.